When Monday Night Football began in September 1970, it quickly became so much more than just a sports contest. Suddenly a pastime reserved only for Sunday afternoons, and after church at that, was now breaking into weeknights, and in the prime-time viewing slot of the early evening. 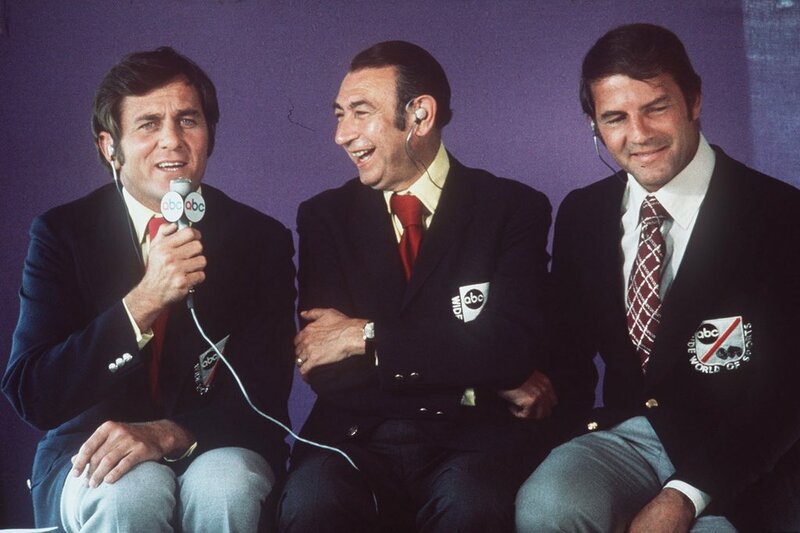 Indeed many people would find themselves tuning in just to see what controversial commentator, Howard Cosell, would say this week, or to witness Frank Gifford and his many gaffes on air, or even Don Meredith’s campfire-style song at the end of each contest. In short, the show transcended sports and still runs today. ​When the New York Jets and Cleveland Browns battled it out on 21st September 1970 it was the first time a professional football game would be played regularly in a weeknight prime-time television slot – one usually reserved for family favorites and intense dramas. Now the drama would be played out on the gridiron each Monday evening from September to December – at least on ABC television. "From Municipal Stadium in Cleveland, Ohio, two powers in professional football meet for the first time ever as members of the new American Football Conference of the National Football League." ​The effects were numerous. Aside from growing their fan base, the sport also began to appeal in a much bigger way to a female audience. This in part was due to the game being put across to the audience in a more entertainment orientated way, as opposed to “just sport!” Similarly, the commentators, particularly Don Meredith who spoke for the “everyday Joe”, made the broadcasts have a more relaxed feel, where they could be enjoyed even if you didn’t know the ins and outs of the NFL’s lengthy rule book. ​In short, the move was a genius one, which not only assisted in the mega-million-dollar television deals being struck over the coming decades but also began to see football replace baseball as the national pastime. The show would quickly dominate the TV ratings for a large part of the 1970s. While Pete Rozelle – the commissioner of the league at the time - had expressed an interest in such a weekly prime-time game, the person behind the overall concept of how this new show would look, is widely regarded as a television genius. The video below shows the intro of the first ever Monday Night Football broadcast and you can read more about the first broadcast here. The man responsible for the concept of Monday Night Football was Roone Arledge, considered by many who worked for him to be a genius in his field if a little unorthodox. That’s not to say people had only the fondest of memories of working with Arledge. He was notorious for not returning phone calls and being almost impossible to speak to one-on-one unless he wanted to speak with you. Some of his employees would even find of their being replaced by being asked questions about the move by the media – most notably when original Monday night commentator, Keith Jackson, learnt of his move to College football for the first time when a stack of phone messages was handed to him at a hotel he was staying in asking him to comment. It wasn’t that Arledge was a particularly cold or malicious man – he was seemingly preoccupied with what he was doing, right there and then. His influence on Monday Night Football is huge, however, and more to the point, his ability, to put the right people both in front and behind the camera. You can read a little more about Roone Arledge here and check out the video below that features Frank Gifford talking about his former employer. Gifford, Meredith, and Cosell Were Genuine Stars! While sports commentators were always well-known to the regular fans who followed their voices each week, when Monday Night Football put forward former players Don Meredith and Frank Gifford along with controversial sports journalist, Howard Cosell, each was turned into stars in their own right. Frank Gifford, for example, with no training other than his time working in the sports booth, would even interview several sitting and would-be Presidents, such was his popularity. Incidentally, Cosell didn’t care at all for the work given to Gifford, feeling that he should have been offered the chance (as a professional journalist) to advance his career. ​During one particular interview in the late-1970s, Meredith would liken being a part of Monday Night Football to be a “touring rock band!” While Gifford and Meredith were genuinely close – and would remain so until Meredith’s death in 2010 – Cosell was largely indifferent to the pair, and would often travel, and even be interviewed separately. Not that the fault all lay with Cosell. If accounts are to be believed, each side of the divide was as responsible as the other for their differences. As we mentioned, Howard Cosell was a controversial figure before the idea of Monday Night Football had even entered Arledge’s mind. The medium of prime-time television for three hours each week, however, catapulted Cosell on to ever higher plateaus. ​By the halftime section, Cosell was clearly slurring his words and going off on tangents, and early in the third quarter of the game, he simply stopped talking – in reality, he was unconscious and on his way back to his home in New York in the back of a taxi. ​Incidentally, ABC and Roone Arledge stood behind their man, insisting to the press that Cosell was merely suffering from an extremely bad cold (which he was – they just left out the part about the vodkas). Check out the videos below. The first looks at Cosell "drunk, and the following looks at Cosell in depth. There is no doubt that Chet Forte was a sports director ahead of his time in many ways. His innovative camera shots and use of multiple cameras and replays, as well as his ability to zero in on players and show the “human” side of the game, contributed greatly towards the shows continued success. He was, however, a man with many demons. Aside from some very sketchy gambling debts (which by all accounts had him at one point a target of a local mafia boss before things were “smoothed over”), Forte’s other real vice was women. ​According to statements in the book “Monday Night Mayhem”, Forte would scan the stands for “pretty girls”, having them smile into the camera in between plays. He would then send a runner to go and bring the girl in question to the production truck. This led to some embarrassing situations, not least the time his boss (Arledge) walked into the production truck unannounced during a Monday night contest while Forte was in the middle of “entertaining” such a young women. You can read more about Forte here. If you have seen a film called ‘Blazing Saddles’ then you very well will be aware of a character named Mungo, whose most famous scene sees him punch a horse out cold. Mungo was played by former NFL player, Alex Karras, and around the same time, following a contract dispute with original commentator, Don Meredith, Alex Karras would spend three years with Gifford and Cosell to make an unlikely, albeit limited, success in the mid-1970s. Karras would, mostly unintentionally, would become the master of quips that live on in American television history – perhaps most notably his reference to Oakland Raiders lineman, Otis Sistrunk, (whose bald head was steaming on the sideline) declared him to have attended the “University of Mars!” – it is a clip replayed on sports and television moments documentaries. In reality, although the comment was indicative of Karras’ style, the Raiders listed Sistrunk’s college as U.S. Mars” – referring to his time spent in the United States Marine Corps. ​As much as he may have tried, and even had people warm to him, the partnership was not the same as the Gifford-Cosell-Meredith one, and when Meredith showed signs of wanting to return to the Monday night show, Karrass’ services were no longer required. Still, for die-hard fans of the game, some of his broadcasts have a cult-like status to them, and he is certainly a considerable cog in the history of the television phenomenon. Frank Gifford discusses Karras below. Most of us are aware of the tragic circumstances that led to the death of one-time Beatle John Lennon, but many people in the United States would learn of the assassination during a Monday night showdown between the New England Patriots and the Miami Dolphins. As the contest edged towards its exciting and tense conclusion, all the air was let of the showdown for the commentators and audience when Gifford stated to Cosell, “I think you have to tell them what we now know…..” . Shortly after, he would announce “...the tragedy confirmed to us by ABC News” that the former Beatle had been shot, twice in the back and was dead on arrival at the hospital. ​The clip is one that is often replayed in documentaries, and despite the game being one of the more exciting of the season, which went down to the wire, there was an obvious heavy feel from the commentators following the announcement. Perhaps even more so because of Cosell’s apparent friendship with the equally controversial Lennon, who had been a halftime guest on the show several years earlier and quipped (about why he annoys people) that “I just have one of those faces I suppose”, to which Cosell sympathized in jest with him. You can see both of those clips below and you can read a little more about the incident here. 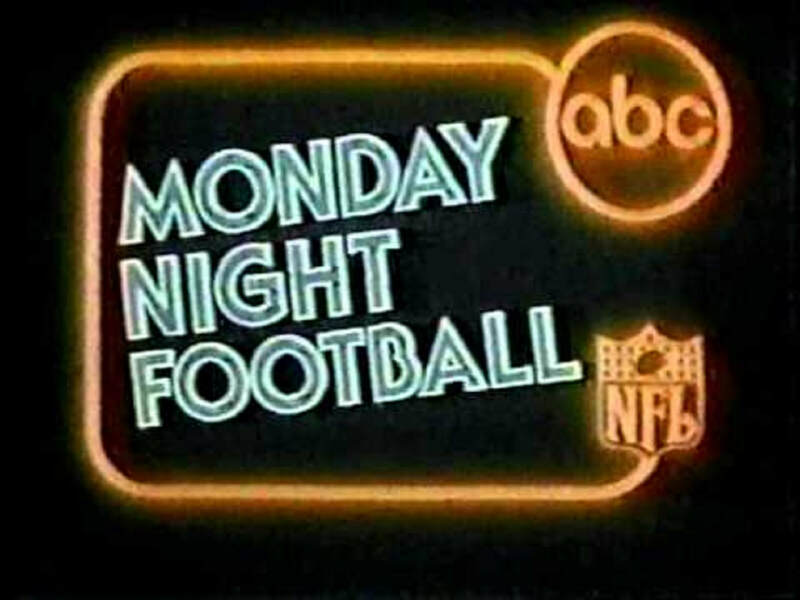 Monday Night Football has continued its run from its inception in September 1970 right the way through to today making it one of the longest-running continual television shows in American television history. It would originally air on ABC until 2006 when ESPN would provide a home for what is now an American institution. Perhaps indicative of the presentation move away from mere sport to “sport as entertainment” is the absolute plethora of special guests who would feature on half-time shows, and even turn up in the booth, during the action, to be interviewed in-between plays. And these guests, for the most part, were A-list type celebrities. While this continues on occasion today, the fever pitch and appeal of appearing on Monday Night Football was arguably at its peak in the 1970s and early-1980s. Aside from the aforementioned John Lennon, other notable names would include Muhammad Ali, James Belushi, Charles Barkley, Bo Derek, and even (then) Vice President George Bush have all graced the Monday Night Football booth. As well as being one of the longest-running shows on American television, it also has several of the highest ranking television shows in American TV history, perhaps most notably the contest between the Chicago Bears (The Fridge and all) and the Miami Dolphins in December 1985, which would draw a share of 46% of the viewing public (almost half of America) and an overall Nielsen rating of 29.6. For a non-championship contest, this is a remarkable achievement. The contest, incidentally, was the Bears only loss that year. There are many reasons for this, particularly that many of these games were contested at a time when the television options were more limited than they are today – basically, most households only had one television (two at best), and if “Dad” wanted to watch the game, everyone watched the game. ​Now, with so many options on how and what to watch, not to mention when you watch it, ratings are a lot harder to achieve and have fluctuated somewhat since the early 2000s. The program still holds its own, however, particularly given it being a sports show in a primetime slot. During the opening contest of the 1983 season, as the Washington Redskins and the Dallas Cowboys faced off, Cosell would utter a phrase that by the end of the contest, had been seized upon and had already traveled around the stadium press boxes and news rooms around the country. As Redskins’ player, Alvin Garrett, took the ball up the field Cosell would matter-of-factly state, “Look at the little monkey run!” Because Garrett was a black player, many would insist this was a racial slur. His fellow booth-mates would defend him passionately, as would ABC, and even the player involved. It was also well-known to those that knew him, the “little monkey” phrase was one he used often, particularly when playing with his beloved grandchildren, and it was nothing more than a comment on Garrett’s escape-ability. Despite this, however, and his well-documented work with black athletes at a time (during the 1960s) when many white journalists simply refused to do so, he was attacked considerably for the comment. The videos below show Cosell speaking about the incident shortly after the comment and other occasions when he had used the comment before. You can also read a little more about the incident here.